As reported over the weekend by CTV and on www.ctvwinnipeg.ca, a small group of Winnipeg artists may hurt the masses. A festival meant to promote Prairie artists has hit a public-relations snag, with a number of artists signing a petition objecting to an energy company’s sponsorship of the event. The National Arts Centre (NAC) is putting on the Prairie Scene Festival in Ottawa and in Gatineau this spring. Billed as the largest-ever gathering of artists from Manitoba and Saskatchewan outside of the prairies, it will feature performances and exhibitions from 500 musicians, dancers, actors and artists. One of the three major sponsors is Enbridge, a Canadian energy company. A petition signed by artists, including novelist Miriam Toews, Winnipeg indie rockers The Weakerthans and musician and Winnipeg Bomber Troy Westwood, objects to the support from the company. Enbridge has sponsored three previous festivals in the Scene series, which have represented the arts from different regions in the country. No one objected in past years when Enbridge sponsored the Alberta, Quebec and British Columbia Scene festivals, Rosemary Thompson of NAC says. According to Thompson, sponsorship from private companies such as Enbridge is necessary to support arts endeavours in Canada. Since the petition became public, the NAC has received numerous letters of support for Enbridge from arts organizations and other groups, Thompson says. In my opinion these artists (and all participants) should have the option not to present their works at the event. That is their right. If they do not agree with the sponsor, they can choose not to show their wares. Or perhaps they should have the well funded environmental groups who are probably behind this tactic against Enbridge, fund the event. Perhaps these artists should understand it is companies like Enbridge (and others) who make such events happen. Without their support of the arts and causes in Canada these “starving artists” would really be starving. I presume these artists may think the government should pay for everything. Possibly it is because these “starving artists” don’t pay taxes either and they feel those that do pay taxes should foot the bill (and buy their products). I do believe it is time that those artists who think this way should each undertake to secure a minimum of $50,000 or more in sponsorship for an event like this to ensure their entry to show themselves and their talents. But they will probably be the same ones who cry that the government won’t support them. These are just one person’s thoughts, let me know yours. While I disagree with the misguided protestations of the artists as it relates to this situation and overall I agree with the sentiments expressed in your post regarding the importance of the corporate sector and specifically oil & gas, I am disappointed (as a client of Partnership Group and an arts organization) in the use of quotations around the term starving artists – essentially giving the phrase a negative connotation. Where did you receive your (False) information that artists don’t pay taxes (I know I pay mine) – can you verify that artists in Canada do not pay taxes? Perhaps the impression that they don’t pay taxes in due to the fact that a large percentage of Canada’s non-profit cultural workers earn wages below the low income cut-off, however at that rate they still pay some income tax and most certainly pay GST & PST on goods purchased. It is the use of sweeping generalizations, as you have used about artists in the latter half of your article, that creates and perpetuates these type of misperceptions about an industry’s impacts, good or bad, on the environment, society, human rights, animal rights etc. etc. – whatever the protest of the day may be. Disagreement is OK – slinging the same mud with falsehoods is not. Stepping back to look at the bigger picture might be to ask what people’s portfolios include which do not use petroleum products or fossil fuels to produce their wares. Maybe the alternate discussion could be to suggest to those who choose a petroleum free life that they eliminate all of the petroleum/natural gas energy and petroleum products from their lives. I would be very curious to see what would be remaining. There is very little in our world that isn’t attached to the petroleum industry much of which has provided society with amazing advances in technologies for saving lives, improved living, travel, etc. The reality is that companies such as Enbridge that continually step forward to support our communities don’t have to make any donations, yet they still do. So why aren’t these companies being embraced for the positive ways that they contribute rather than being politically played in the wrong forum. Perhaps the focus of this grandstanding petroleum debate can be better directed toward positive change and better yet action. The old adage comes to mind, don’t just stand there complaining, do something to change it. Scott, you are right, perhaps the generalization in regards to “starving artists” was too broad. I am aware of the important role that the arts and artists bring to our communities nationally and locally and also aware that it is the few (as in most cases) who make it tough for the many. Organizations like Pump House Theatre Society, Sask Arts, many other theatre and dance companies and events at the Forks in Winnipeg and CISCO Blues Festival in Ottawa all are hugely successful in sponsorship and they do it right. It is the concern of the vocal few who are often the ones constantly relying on government funding for revenue that worry me and our society. I know for the most part artists pay taxes and are often underpaid, they are both social and financial contributors to our vibrant Canadian economy. As John Paul Ellson commented directly to me by email, we need to look at how many events and how much economic activity is generated around the arts. This is huge, what we need to look at is the few in the industry (and it is always this way) who make it rough rides for the many who are so strong and contributing. Thanks for your feedback on the blog. The debate is good and agreed “mudslinging” should not be part of it. I look forward to the continued discussion. I enjoy your Sponsorship Update a lot (even though I do find it a bit west-centric!). It has spurred me on through many “cold call Tuesdays”. However, I think you went a bit too far saying artists don’t pay taxes. Arts and Culture is a huge economic generator (in New Brunswick today it surpasses both the fishing and the logging industries) and I know lots of artists who are excellent business people who pay their taxes like you and me. As citizens of our free nation it is their right to choose to sign the petition and to not participate, as you suggest. However, the role of artists in society is to push the limits and make people think. I definitely agree that, without corporate sponsorship, many great cultural events would not enjoy the success that they do currently. These artists should seriously rethink their protest of this company, or at least tailor their discussion to better address their environmental concerns specifically. @McLean – Very interesting comment on how artists’ livlihoods (sp) are so closely tied to the petroleum industry, just like the rest of us. I will not generalize for all artists, but I do find that some think that they are somehow removed from culture and can merely sit above and observe the comings and goings, while not interacting with the evils that they depict in their work. No man is an island! PS @Dawn: I too hate “Cold Call Tuesdays”, except in my week it’s also cold call Monday-Fridays. But I do look forward to the sponsorship commentary as a good cold call distraction. 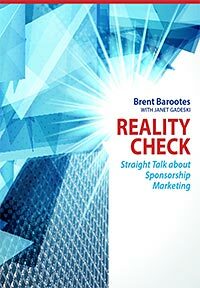 As a member of this profession who has both bought and sold sponsorships ranging from the arts to sport to not-for-profit organziations who are all competing for the same buck, I find the unrealistic expectations of those who protest and question the integrity of the few companies who are willing to step up and support worthwile causes to be incredibly short sighted and naive. I appreciate the artists and the sportsmen who strive to perfect their chosen passion in life, but I am often frustrated by those same people who leave it to others to try and go out and attract those few companies who are willing to support them. I believe it is better to work with those who challenge your point of view than to alienate and disassociate yourself from them.